11 clusters from Northern Africa and the Middle East travelled to Barcelona to discover and learn from successful Catalan clusters thanks to the Cluster Booster Track, THE NEXT SOCIETY support programme for Mediterranean clusters. Within the framework of the Cluster Booster Track - one of the pillars of THE NEXT SOCIETY initiative - a series of benchmarking visits and training sessions have kicked off in Catalonia and will then be held throughout Europe. This activity is the first service delivered in the framework of the Cluster Booster Track, THE NEXT SOCIETY support programme for Mediterranean clusters, after the diagnosis process that identified the topics which the 26 selected clusters intend to deepen: financing model, service portfolio development, set-up of a team, members engagement, etc. From 19 to 23 November 2018, 11 clusters from Northern Africa and the Middle East participated in capacity building and training workshops tackling the topics of strategy, communication and member engagement. These workshops were combined with visits to local clusters such as the Solar Energy Cluster (Solartys), the Light Technologies Cluster (SecPho), the Catalan Water Partnership (CWP), the FEMAC, the Catalonia Gourmet and the Beauty Cluster Barcelona, as well as a networking meeting held with the 30 Catalan clusters present in the Espai Catalonia Clusters, a 400 m2 co-working space. The Northern African and Middle-Eastern clusters attending the sessions were the Bizerte Competitiveness Pole (Tunisia), the Northwest Olive Oil Cluster (Tunisia), Dates & Palm Cluster (Tunisia), Primeurs du Sud (Tunisia), House of Furniture (Palestine), The Leather and Shoe Cluster (Palestine), The Stone & Marble Cluster (Palestine), Tourism and Creative Arts Cluster Jerusalem (Palestine), MENARA (Morocco), CE3M (Morocco) and Oasis500 (Jordan). Mediterranean cluster managers were able to acquire new tools and methods, identify good practices, work on practical cases but also initiate cooperation with their Mediterranean and European counterparts. The Benchmarking Visit and Training of THE NEXT SOCIETY in Barcelona were organised by ACCIÓ - the Catalan Government agency for business competitiveness, depending on the Ministry of Business and Knowledge - together with France Clusters, both THE NEXT SOCIETY partners contributing to the development of the Cluster Booster Track. Other Benchmarking Visit and Training sessions will be hosted by regional agencies supporting the internationalisation of enterprises in Wallonia (Belgium), Region SUD Provence-Alpes-Côte d'Azur (France) and Piedmont (Italy). THE NEXT SOCIETY Cluster Booster Track offers a full action plan intended for clusters. 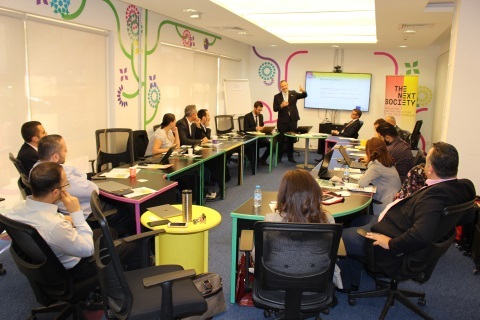 It is an exciting peer-to-peer learning and booster programme, which will help cluster managers from Algeria, Egypt, Jordan, Lebanon, Morocco, Palestine and Tunisia to improve their management skills, multiply their business opportunities and open new channels of inter-clustering collaboration at national and international level. The Cluster Booster Track is made of the following steps: Needs diagnosis (complete); Training and benchmarking visits; Cluster mentoring, #TechDays, International Market Missions. All actions will help to develop the strategic cooperation between European and South-Med clusters, supporting the creation of strong cluster community in the Mediterranean. In order to sustain and support regular exchanges among this community, the online collaborative network i-Community has been recently launched. To know more about the participants, click here. To discover the i-Community social network, click here. To download the press release (PDF), click here.